f you are looking for a late night quick bite after getting off a long bus journey at the bus station, just go straight out of the bus station. Cross the street, keeping the gas station on your left and walk up Jerusalem Street towards the gesher (bridge) and the midrahov. As you continue walking up the street, you will find a few snack bars that stay open quite late. There are almost no other snack places in central Safed normally open this late at night so grab your chance while you can. On your left the first snack stand you come to is a nice trendy looking shwarma bar. With three tables outside in summer and 2 tables inside as well, as a long bar with 5 stools, you can enjoy your meal in comfort. Prices start at 22nis and you can have your shwarma on a plate and sit down, or have it in a pita or baguette to take away. This stand is also licensed so you can drink a beer with your meal. You can certainly eat with gusto here, enjoying a variety of different meats and chicken until 2am! If on the other hand you prefer pizza late at night why not try the recently opened Pizza Pie, just across the street. With four tables inside and three outside during the summer, there is plenty of room for soldiers who appreciate the 10% soldiers discount and the free toppings given by the pizza parlor. As it also has a B'datz hechsher don't be surprised to see a lot of 'black hatter' yeshiva students in the parlor. Apart from regular pizza (40nis for a pie) you can have toasts, garlic breads and salads. They also offer ice-cream as a dessert and have a good choice of soft drinks. 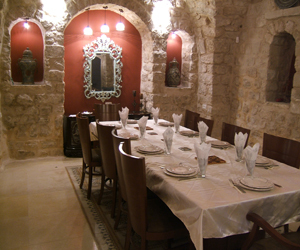 The pizza parlor offers free delivery within Safed. Just up the street again you will find another small shwarma bar simply called Rafi's Shwarma. With two tables outside for summer and three inside you can easily chat with the friendly staff in the cozy atmosphere. Apart from the usual shwarma choices you can also get falafel and French fries. Prices are fairly standard for Safed with shwarma in a pita at 25nis and a larger shwarma portion in a baguette.